Waterproof, shockproof, dustproof and freezeproof – what else does the Fuji Finepix XP10 have going for it? 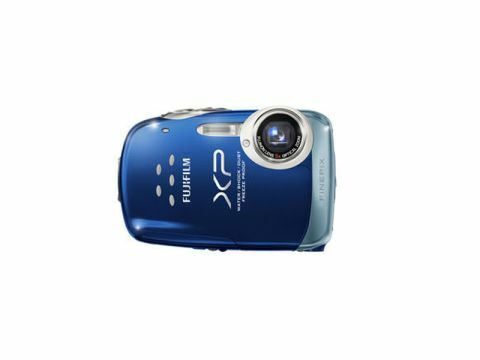 The Fujifilm Finepix XP10 is a bit of a strange-looking compact camera. Without classic looks, the rounded edges and bulbous design hides a rugged camera that is water, shock, dust and freeze proof. The buttons, as you'd expect from a camera designed to be dunked underwater, are rubberised, but they're not too difficult to push. The shutter release requires a heavy push, presumably so that it doesn't actually take pictures when you throwing it round a mountain. Simplicity is the order of the day, and there's not a huge amount of buttons on the back of the camera, but all the basics are present and correct. It's good to see a dedicated movie button, as for the situations this camera is specifically designed for tend to rely on quickness. The menu system isn't the most attractive we've seen, but it is fairly easy to navigate and understand, and everything makes sense. There's a minimal amount of modes on offer, but it does include Program AE, Auto, Scene Recognition, Natural Light and a number of the usual scene modes (i.e. landscape, portrait, party etc) with underwater also thrown in to make use of its waterproof capability. Screen-wise, this isn't the best LCD we've seen on a compact by some way, but given that it's designed to be rugged, this is hardly a surprise. Still, it does the job perfectly well and is easy enough to use in bright sunlight.